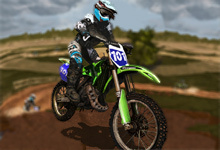 Welcome to the best motocross in the world. You are a Sahara biker that has only one wish: to beat the world record. All you have to do is to be inspired by the amazing Sahara and love biking. The racetrack is dangerous and beautiful, with one word- beautiful. 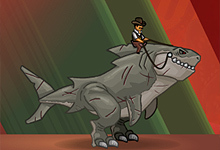 Now, go and accept the challenge of 10 incredible levels of increasing difficulty. 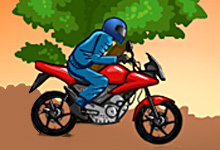 At the beginning on the first two levels you have an opportunity to ride only one bike and later as you unlock the third level, you can pick up another bike, which will be with better acceleration, torque and handing. Awesome music will follow you through your adventure, but still if somehow you are distracted by it, just click the button on the upper right corner and turn off the music. If you get stuck click the button next to the sound button and pause and thus you can restart the level. Press up arrow key to accelerate, down to go backwards and the left/ right arrow keys to keep balance. 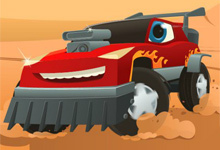 Get to the finish line as quicker as you can and get the best score possible. 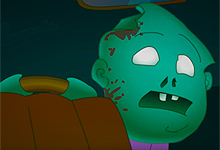 Complete all levels, get the gold and have the best time ever! 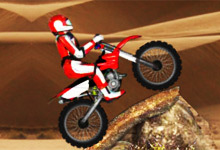 Sahara Biker is a free game which can be played at bikegames.biz. 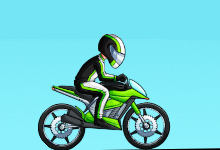 This game have been rated from administrators of bikegames.biz with 4.70 stars out of 5.